We’d love your help. 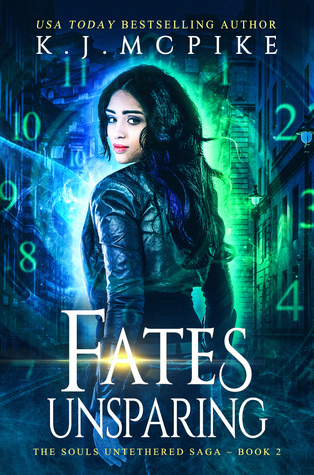 Let us know what’s wrong with this preview of Fates Unsparing by K.J. McPike. To ask other readers questions about Fates Unsparing, please sign up. In a very short time, I have become a HUGE fan of Kelly McPike's writing. You can't help but admire an author who can craft a world involving such fantastical elements as astral projection and time travel with such precision and intricate detail, and yet still find a way to keep the story moving at a brisk pace. Following the events of XODUS and Nemesis, Lali and her siblings must deal with a tragedy so terrible that they cannot accept it - and as a reader, neither could I - so they formulate a p In a very short time, I have become a HUGE fan of Kelly McPike's writing. You can't help but admire an author who can craft a world involving such fantastical elements as astral projection and time travel with such precision and intricate detail, and yet still find a way to keep the story moving at a brisk pace. Following the events of XODUS and Nemesis, Lali and her siblings must deal with a tragedy so terrible that they cannot accept it - and as a reader, neither could I - so they formulate a plan to travel back in time to prevent it from happening in the first place. Unfortunately, things soon go from bad to worse, as usually happens when people try to muck with the time-line. Whew ... I was up late into the night with this one. I absolutely loooove this series. Lali is one of my favorite heroines for one main reason. Everything she does is for her family - or trying to help someone else's family. She knows that family is everything. It's no different in this book. Helping Kai leads to some drastic consequences once again. Honestly, that boy always brings her trouble. As much as I feel for him, Lali should stay far far away unless she wants to end up six feet under. I Whew ... I was up late into the night with this one. I absolutely loooove this series. Lali is one of my favorite heroines for one main reason. Everything she does is for her family - or trying to help someone else's family. She knows that family is everything. It's no different in this book. Helping Kai leads to some drastic consequences once again. Honestly, that boy always brings her trouble. As much as I feel for him, Lali should stay far far away unless she wants to end up six feet under. In this book, we see more of the other realm where her mom is from, which is pretty cool. We see a lot of the labs Delta and Kala were kept in and everything starts to round out more. I received a digital copy of this book thanks to K.J. McPike. I was introduced to the Astralis series back in 2015 and found myself falling in love with the series almost instantly so I was really excited to get stuck into Tenuous! Following the events of XODUS and Nemesis, Lali would rather not have anything to do with Kai but when he comes back into her life with a matter of life and death, she can’t ignore his pleads for help. When the unthinkable happens, Lali risks everything and goes back i I received a digital copy of this book thanks to K.J. McPike. Following the events of XODUS and Nemesis, Lali would rather not have anything to do with Kai but when he comes back into her life with a matter of life and death, she can’t ignore his pleads for help. When the unthinkable happens, Lali risks everything and goes back in time to change things. But going back in time was the easy bit, getting home again is far more dangerous than she could have ever imagined. It’s been a little while since I read Nemesis but from the moment I started reading Tenuous, it was like I’d never left. Once again, I was swept into the unpredictable (and increasingly dark) world of the Astralis series. I found myself completely invested in the lives of Kai and the Yavari family and in awe of the new and extraordinary friends they meet on their journey. Writing a book with a time travel plot could not have been an easy task but as always K.J. McPike has done an amazing job of letting us spend time with the characters we love but also keeping the story flowing at a quick pace. From the very beginning, there is always something happening that will keep you hanging onto every word. Every chapter is charged with emotion as the characters suffer heartbreak, face impossible tasks and find the strength within them to give second chances. I loved every last page of it and cannot wait to see what happens next. I’ve been waiting to get my eager little hands on Tenuous, and now that I have, I can honestly say…I absolutely LOVED it. Once I started reading, I was once again completely invested in the characters and swept right back into the story. Hiding from the Eyes and Ears, all Lali wants is to go back to the way it was before her life got turned upside down, but things are never that easy, especially when fate has other plan. And even though she wants nothing to do with Kai (and for good reason) when I’ve been waiting to get my eager little hands on Tenuous, and now that I have, I can honestly say…I absolutely LOVED it. Once I started reading, I was once again completely invested in the characters and swept right back into the story. Hiding from the Eyes and Ears, all Lali wants is to go back to the way it was before her life got turned upside down, but things are never that easy, especially when fate has other plan. And even though she wants nothing to do with Kai (and for good reason) when he comes to her asking for help, she can’t refuse. It’s a decision that will change everything and afterwards, nothing will ever be the same. With a storyline like that, how could I not be hooked? And believe me I was hooked. This book had everything needed to keep my eyes glued to the page: twists, turns, and impossible tasks mixed together with heartbreak and second chances. I cannot wait for the next book in the series to come out. I was given an ARC copy of this book from the author. After reading the last book, I've been long since waiting for this one. So it feels really great to be finally reading it. And I can definitely say that I'm pleasantly surprised and not in the least dejected. The book seems to have almost surpassed my expectations. So I think all the waiting for the whole year was worth it. The author has done some fantastic work. Given the plotting and the time travelling stuff, writing this story must be a very tough task. So I think she's done some excellent job here. It feels like K.J.McPike has clubbed in all sorts of cool and amazing supernatural powers one can think of. And the names still don't cease to amaze me. The story is very well laid out at a perfect pace which keeps us glued to the book. The suspense and the atmosphere is very much charged with all the emotions. You could feel all the tension that's around there. And the language is simple and gives the perfect feel. Everything is just so well put up. I'm still in awe of all the stuff that happens in the story! I love this story! I am so hooked. Book 2 blew my mind. There was so many things going on. Every moment was heart pounding for me. I couldn’t stop reading until I finished it. I loved book 1 and with book 2 it really is even better! The story is so addicting. I can’t wait to find out what happens next! Highly recommend this series! I need to know what happens next! Sooo GOOD! Another excellent page-turner by McPike! I was surprised at every turn and felt myself getting more and more invested in the characters as their struggles increased unpredictably. Can't wait for the next book!